MANILA, Philippines – The Civil Service Commission (CSC) officially released the results of March 18, 2018 civil service exam or career service examination - paper and pencil test (CSE-PPT) in 59 days after the exam. 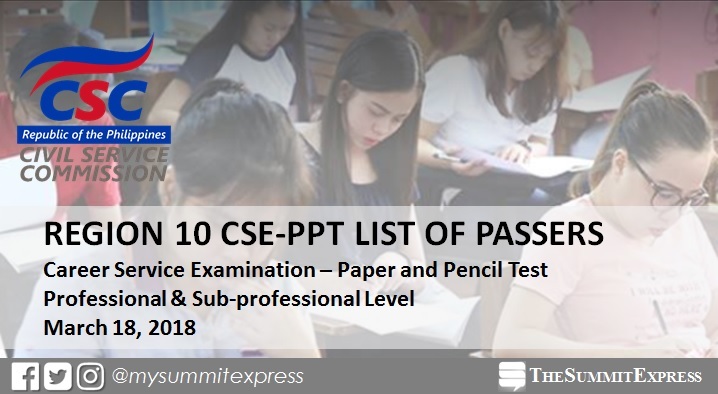 The complete list of passers for Region 10 (Northern Mindanao) is posted on this webpage and on CSC website (csc.gov.ph). The results include alphabetical list of passers for professional and sub-professional level, the two types of examination for the biannual civil service exam. The career service examination is a general ability test designed to measure an individual’s preparedness to enter government service. Passing rate is set at 80-percent.